I'm currently implementing a UI for a configuration application. The typical user would be an employee changing the configuration parameters of some client software (like theme, available features to the actual user of the client software, ...). 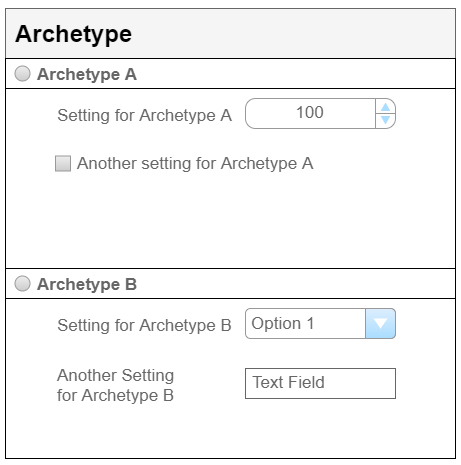 At some points, the user has to choose one of multiple archetypes (with one being preselected) and can then configure additional settings specific to that archetype. We have a radio button for each archetype and the sub-settings in an additional panel below the corresponding option. Obviously, the exact parameters of the logical side can change, e.g. more archetypes, or more sub-settings, or some archetypes without sub-settings. Is this UI layout working out in terms of UX? Consistency and standards Users should not have to wonder whether different words, situations, or actions mean the same thing. Conclusion: the second navigation scheme was dropped from the design, even though this pained some of the project members. The second scheme had its advantages for those people who used it correctly, but it led most users into trouble, so it did more harm than good. Not the answer you're looking for? Browse other questions tagged usability gui-design interaction-design radio-buttons or ask your own question. Best way to deliver “mockup tool kit” to engineering team? Flexibility-Usability tradeoff: Is it OK to recommend a specific set of security settings? What's a good way to select a single pane of other controls?